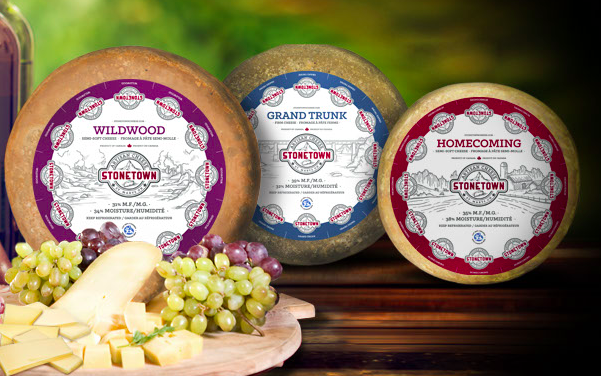 Try and buy Grand Trunk and other award-winning cheeses from Stonetown Artisan Cheese at Canada’s Artisan Cheese Night Market in Toronto on June 6. Grand Trunk is a best-seller for good reason: It tastes great, it really does! Grand Trunk, the most popular cheese made by Stonetown Artisan Cheese in St. Marys, Ontario, is named after the historic railway bridge of the former Grand Trunk Railway in St. Marys. On the outside of the cheese, the rind does have an old rustic look, just like the historic bridge. But cut open a wheel and inhale the aroma. You’re immediately transported to the Swiss Alps where the fragrance of alpine meadows fills the air, mingling with a robust aroma of dairy. Place a piece in your mouth and let it melt. It’s so rich and creamy, so packed with layers of flavour, with a nice balance of salt. Grand Trunk is aged six to nine months and more. The older the better the taste, we say. That’s award-winning Grand Trunk, the pride of cheesemakers Jolanda and Hans Weber who came to Canada in 1996 from their native Switzerland, with three children in tow, to begin a new life in St. Marys on their own dairy farm. The milk is thermized, which means its heated to reduce spoilage bacteria with minimum collateral heat damage to milk components. Artisan cheesemakers prefer thermization to pasteurization as the former does not cause changes in flavour. The taste of place is definitely the Swiss Alps, although the cheese is made in Southwestern Ontario. You’ll have a chance to meet Jolanda and Hans and sample their delicious cheese at Canada’s Artisan Cheese Night Market at historic St. Lawrence Market’s Temporary North Hall in Toronto on June 6. Grand Trunk, which is aged six to nine months, was crowned Grand Champion in Specialty Cheese at the 2018 British Empire Cheese Competition. Jolanda and Hans Weber with Master Cheesemaker Ramon Eberle. Grand Trunk tastes excellent in sandwiches or just on a cheese platter with fruits, dried meat and rustic bread. It is a great cheese for fondue or grilled cheese sandwiches. Due to its unique flavor, the cheese pairs well with both red and white wines. TICKETS ARE SELLING QUICKLY, SO DON’T DELAY ORDERING YOURS! Canada’s only Artisan Cheese Night Market is a unique sampling show where you try before you buy, located in Toronto’s historic St. Lawrence Market Complex, one day only, Thursday, June 6. Live entertainment will keep the celebration going all night long. Order your tickets right away as the event is sure to sell out! To avoid overcrowding, the Night Market runs in three three-hour sessions, 12 noon to 3:00 p.m., 3:30 to 6:30 p.m., and 7 p.m. to 10 p.m. Strictly 19+. Admission to the Early-Bird Session 12 noon to 3:00 p.m. is $30.00 per person. Regular admission is $40.00 per person for Session 2 or Session 3. Click on the Eventbrite button to begin your order. 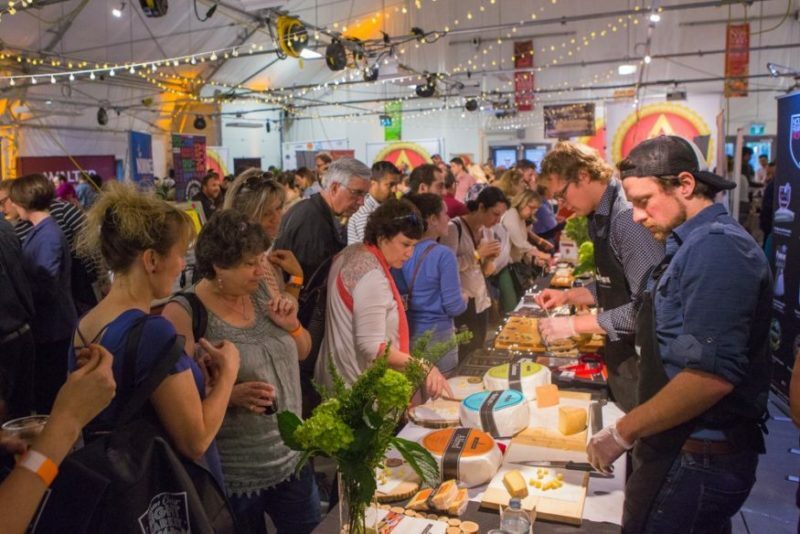 Many of Quebec’s outstanding cheesemakers will be represented at this year’s Artisan Cheese Night Market in Toronto, appearing under the Amour & Tradition umbrella of Fromages CDA, a leading distributor of fine cheeses. Your ticket covers sampling of award-winning Canadian cheese, charcuterie, chocolate, artisan foods, olive oil, plus Ontario wine, craft beer and cider, and spirits. That’s correct, sampling is included in the price of admission. PLUS: Also included is an insulated souvenir tote bag for your purchases. Order tickets in advance online, avoid having to line up to buy a ticket at the event and quickly access all the deliciousness via the Night Market’s Express Entrance. Click here for information on attending as a group, having more fun and saving money! Stonetown Artisan Cheese of St. Mary’s, Ontario, will be sampling and selling its many delicious cheeses inspired by centuries of cheesemaking in Switzerland. For the Artisan Cheese Night Market, historic St. Lawrence Market’s Temporary North Hall at 125 The Esplanade will transform into a celebration of the best in Canadian cheese and other deliciousness. Using public transit to get to St. Lawrence Market is a snap. Union Station, with GO, Via Rail and TTC subway stops, is an 11-minute walk. The Yonge subway stop at King is a 12-minute walk. The Market is mere minutes from TTC streetcar stops at Jarvis on the King and Queen lines. There also is a Jarvis bus that stops steps from the Market. Taxi and Uber will get you there even quicker. If you’re coming by car, designate a driver for a safe trip home as there will sampling of alcoholic beverages at the Night Market, if you’re so inclined. There will also be a cash bar. In its debut in 2018, Canada’s only Artisan Cheese Night Market was a sell-out success—and a huge hit with cheese lovers. Available at all price levels within walking distance of St. Lawrence Market. Canada’s only Artisan Cheese Night Market is produced by Cheese Lover Productions Inc. which also produces Canadian Cheese Awards and The Great Canadian Cheese Festival. In 2018, Artisan Cheese Night Market was first held in conjunction with Canadian Cheese Awards. Given the enthusiastic response from cheese lovers, the Night Market returns in 2019 as a stand-alone event. 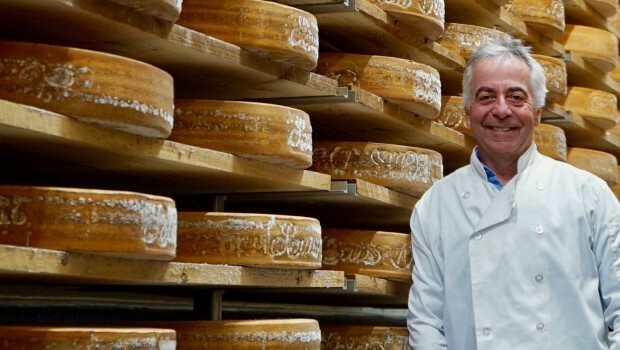 Louis d’Or, made by Jean Morin of Fromagerie Presbytere, is the 2018 Cheese of the Year. Louis d’Or, an outstanding Alpine-style cheese made by Jean Morin of Fromagerie du Presbytère in Sainte-Élizabeth-de-Warwick, Québec, was named the 2018 Cheese of the Year in the biennial Canadian Cheese Awards, the biggest cheese judging and competition in the country. The 2018 Canadian Cheese Awards program, which started at University of Guelph, Food Science Department, with the judging of 375 submitted cheeses in late February, culminated June 6 with a presentation ceremony and tasting gala at historic St. Lawrence Market in Toronto. Loblaw Companies is Marque Sponsor of Awards while Dairy Farmers of Canada is Principal Partner, Cow Milk Cheese. Judging by a jury of 14 cheese experts took place at University of Guelph, Department of Food Science, in February. A total of 117 finalists were selected from the 375 cheeses entered by producers from Newfoundland to British Columbia. The 2018 Canadian Cheese of the Year and champions in 33 categories were announced at the Awards Ceremony on June 6 at St. Lawrence Market in Toronto followed by an Awards Tasting Gala. The next day, winners were featured at Canadian Cheese Expo for the trade followed by Canada’s first Artisan Cheese Night Market open to the public. Fifty-six of the 117 nominations went to 22 Québec cheese producers led by Fromagerie La Station, 7 finalists, Laterie Charlevoix, 6, and Fromagerie du Presbystere, 5. Sixty-one of the 117 nominations went to 23 producers in English-Canada, led by Cows, 12 finalists, Glengarry Fine Cheese, 5, and Amalgamated Dairies, Cross Wind Farm and Mountainoak Cheese, 4 each. Canadian Cheese Awards is the only pan-Canadian cheese competition open to all milks used in cheesemaking—cow, goat, sheep and water buffalo—with only pure natural cheese accepted for judging. That means no artificial colours, flavours or preservatives, and no modified milk ingredients. The biennial Canadian Cheese Awards is produced by Cheese Lover Productions with the support of Loblaw Companies as Marquee Sponsor and Dairy Farmers of Canada as Principal Partner, Cow Milk Cheese. The Great Canadian Cheese Festival in Picton, Ontario, is on hiatus in 2018 to allow resources to be devoted to the launch of Artisan Cheese Night Market and related events. From our house to yours, all the best of Christmas! May much good Canadian cheese be with you in 2019! Second-generation dairy farmer Steve Runnulls shown in pasture with one of the Holstein cows on his farm in the heart of the Temiskaming Valley. Hard to believe that such lush green pastures can be found in Northern Ontario, some 500 kilometres north of Toronto. It never ceases to amaze how far north in Ontario dairy farming and cheesemaking prosper. Now comes news that Thornloe Grass Fed Butter has received the Grand Champion Award in the butter division at the Royal Agricultural Winter Fair. The taste is simply stunning. Once you’ve tasted Thornloe Grass Fed Butter, regular butter tastes flat. Farmer-owned Thornloe Cheese near New Liskeard—some 500 km north of Toronto—introduced grass-fed butter products in salted and unsalted formats in the summer to meet the growing demand for grass-fed dairy products. Grass-fed cheeses were introduced by Thornloe in 2017. Fourteen farms supply milk to Thornloe from the northeast region of Ontario, with project roots in Temiskaming, hence, the name of the butter, Temiskaming Valley Butter. The region is located 500 km north of Toronto, in the clay belt region known for its farming culture. Thornloe Grass Fed Butter received the Grand Champion Award in the butter division at the Royal Agricultural Winter Fair. Thornloe Grass Fed Butter and Cheeses are available through cheese shops, grocery stores and foodservice providers. Thornloe Cheese Inc. is a wholly farmer-owned, artisanal cheese producer. It has earned several national awards and a reputation for quality cheese and creamery products for more than 75 years. Its most popular products include traditional cheddars, poutine curds, fine cheeses and the iconic blue cheese named Devil’s Rock. Thornloe is farmer owned, a subsidiary of EASTGEN, a farmer owned company located in the Guelph region. In 2017, Thornloe won the Food in Canada community and industry leadership award for its role in the innovation and collaboration bringing to market Canada’s first verified grass-fed feed and pasturing standards.